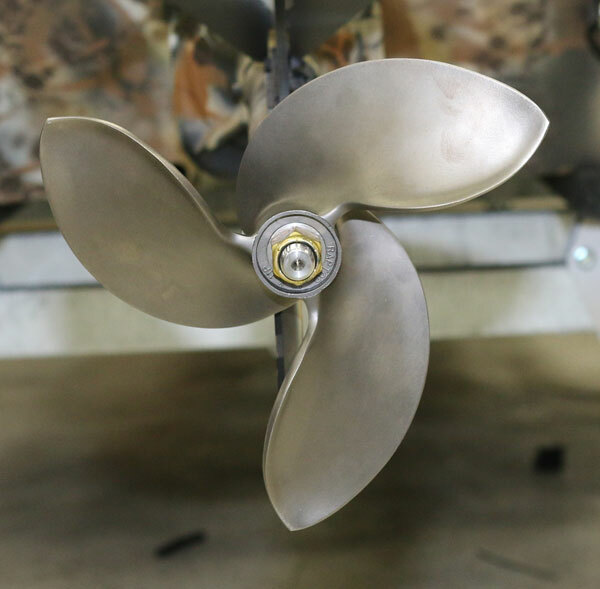 Hands down, the Big Blade is the best mud motor performance propeller in the industry. Today the Big Blade is even better - the newest design has a larger pitch, superior thrust in reverse and outstanding top end speed. Most propellers loose their thrust when the end of the blades wears out. The Big Blade has it cup on the trailing edge where it lasts the life of the propeller. Available in the 3/4" hex or 7/8" threaded versions. Today, all Mud Buddy motors use the 8300 lb. 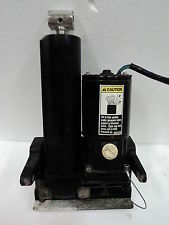 Mercury built electric/hydraulic trim units. We also use the time proven Mercury trim switches. This robust trim unit is a natural for our harsh environment application. Mercury uses this trim unit on its heavy duty 115 horse outboards. No more reaching behind you and looking backwards, and taking your eyes of the road ahead to engage the clutch, shift and trim the motor. Plus the safety lanyard is easily wrapped around your left hand or attached to your jacket or waders. Safer, easier, innovative and common sense solutions for skilled backwater mudders. - Engine Heads, valves, pistons, rods, cams, carbs, etc. Guys you need to check out this new hot blade. Gets your boat up on step right now. Great top end speed and super thrust in reverse. Standard on all 4400 motors. Never missing an opportunity to play in the mud, the Gator Trax team went down to Delacroix, LA after 4 days of hard NW wind that emptied the marsh. We went to get some still shots for some ads but wound up with some video of us in the process that we thought you'd enjoy. So...enjoy! OPTIFADE™ camo will be available directly from Mud Buddy. This pattern is exclusive to Mud Buddy and Excel. Sitka released the camo pattern at the Vegas Shot show this year. OPTIFADE™ technology is the first concealment of its kind based not on human vision, but on the visual capability of your targeted prey. GORE™ OPTIFADE™ pattern takes into account how ducks and geese see the world below them, and works to inhibit visual stimulation and delay detection. While mimicry patterns attempt to make the hunter look like something, OPTIFADE™ digital concealment pattern makes the hunter appear to be nothing. And most importantly…….it looks awesome too. Drake Waterfowl®, innovators in waterfowl hunting, is proud to introduce the 2016 Migration Nation with host, J. Paul Jackson. 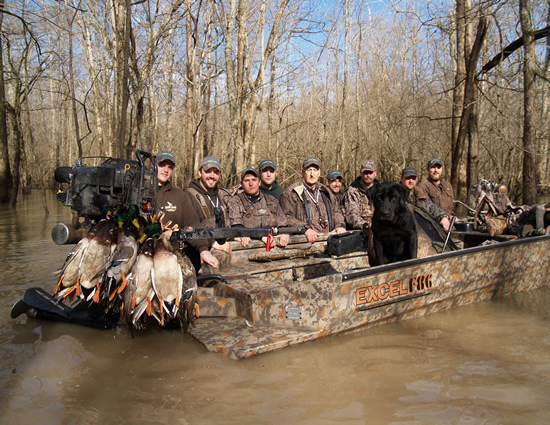 This exciting waterfowling show on The Sportsman Channel® is the result of years of planning and preparation. Much like Drake Waterfowl's innovative approach to building waterfowl gear, Migration Nation is a unique show offering a firsthand view into the blind with some of the best waterfowl hunters in the country. 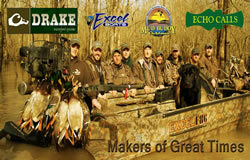 Mud Buddy and Excel Boats are the premier sponsors of Drake's Migration nation, our third year with this elite team of friendly and exciting hunters. 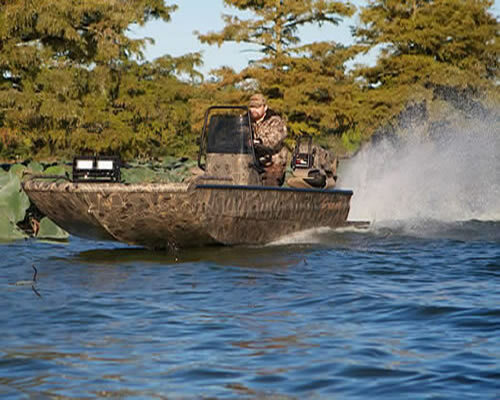 Look for Mud Buddy and Gator Trax Boats on Swamp People and Duck Dynasty this season. From hole shots to top end speed, the finest Vanguard Big Block. 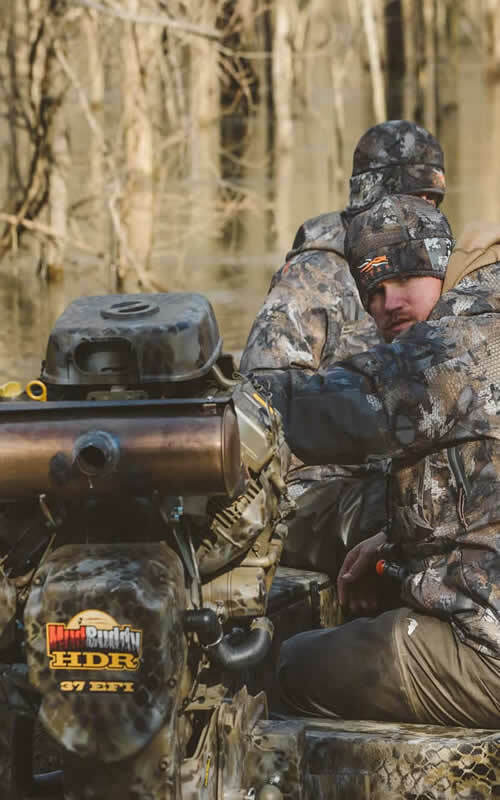 Mud-Buddy and Briggs & Stratton Commercial power have teamed up to deliver an engine perfectly suited to the harsh demands of today's mud motors - the 37 Gross HP* Vanguard® BIG BLOCK™ EFI V-Twin. 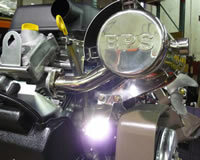 Vanguard's open-loop EFI system offers automotive-style no-choke starting, smoother operation, and increased performance. EFI Port Fuel Injection – controlled by the ECM, the fuel pump pressurizes the fuel before it reaches the injectors, delivering the exact amount need to the combustion chamber. Displacement: 993cc, 61 cubic in. The Q "Quiet" stainless muffler is the most aggressive, deepest sounding, highest performing backwater muffler Mud Buddy built. They are ideal when dynamic sound, torque, and horsepower improvements are demanded by out customers. Their maximum performance and improved flow path will generate more torque and power than ever before! If you really want to move larger boats and loads faster, then these Q mufflers are for you. One year warranty. HDR - New Hyper Drive Reverse - so simple and easy to use. "Backwater King"
Backing up could not get easier. The best selling mud motor in the world just got better. This all new electric shift F-N-R drive has the controls on the end of the handle. The Mud Buddy HDR is different and new - it is quick and easy to use, locks solidly with the largest electric clutch reverse gears. Once engaged and ready for work, our high power special gear ratio and new high pitch reverse propellers provide unparalleled power when you need to get off your trailer, out of a mud hole, or back out of a one way channel. 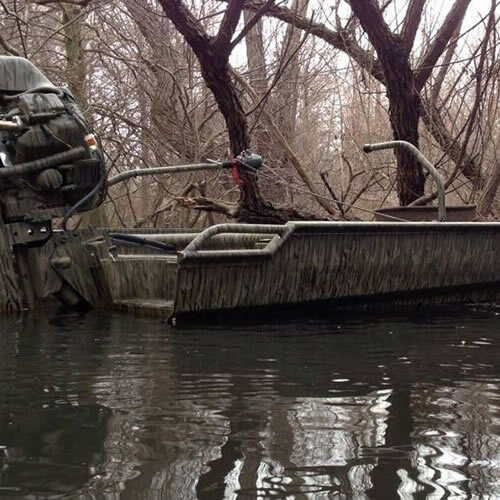 Coupled with other unique Mud Buddy features such as handle end controls, Mercury power trim, built in travel lock, only stainless steel drive tube and skeg, patented bearing drive and the larger and most powerful engines in the world, these motors are said by many "The Backwater King". In July 2015, we will release our stainless version of the HDR. The drive tube, skeg, motor position plate, swivels, etc will all be 304 stainless. Check out the exclusive features. 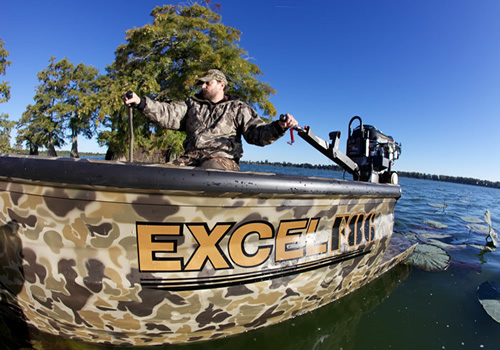 Excel - Mountain View Arkansas is well known for producing the toughest mass production boat on the market today. 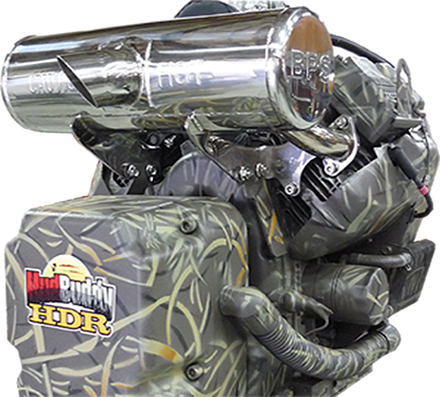 These high end duck boats are a perfect match for the new Mud Buddy Sport V (shown) and the HDR belt drive reverse motors. 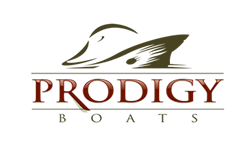 If you are looking for a production custom boats, contact our good friends at Gator Trax. Check out the new Marsh Series. Watch for us on Duck Dynasty, Swamp People and Drake's Migration Nation this season.